and risk management related software. Welcome to Right Side Creations, LLC. Right Side Creations owns intellectual property rights to diverse items, including biographies and technical books, as well as insurance and risk management related software. As you browse our offerings and choose your favorite, know that each has been created with the intent of adding value to your life in some fashion. Want to learn about the life of one of Nashville’s most interesting and talented, but little-known, singer/songwriters? 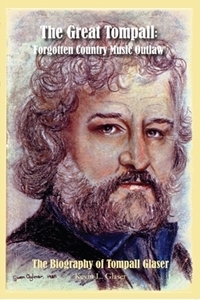 The Great Tompall: Forgotten Country Music Outlaw biography is for you. Tompall Glaser’s life story is told through his own words and by those who knew him best. If you are a “classic” country music fan you will not want to miss out on this highly acclaimed gem. Searching for a competitive edge to gain knowledge about secret behind-the-scenes inner workings of the insurance industry that will put you in control of your insurance buying decisions? 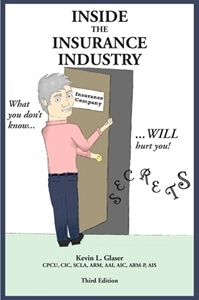 Inside the Insurance Industry - Third Edition is for you. Our book has been included in several lists of "Best Insurance Books" and reviews have been stellar. Author Kevin L. Glaser, CPCU, CIC, SCLA, ARM, AAI, AIC, ARM-P, AIS has spent more than 30 years working in all facets of the insurance industry. Beyond a background that includes working for insurance companies Glaser currently serves as a national consultant, risk manager and expert witness in litigation involving insurance related issues. Do you want to identify specific business and personal risk exposures to discover ways to insure gaps you now have and/or to apply specific risk management techniques to reduce or eliminate identified exposures? Our RISC Analyzer©™ software is for you. Unless you avoid risks or transfer risks through the purchase of insurance, you are on the hook when an occurrence takes place – and that will cost you money. Out-of-pocket losses can be significant and can have a tremendous negative impact on your financial situation. The RISC Analyzer® asks probing questions to identify exposures, allowing you to take appropriate actions before it is too late. Note: Bulk book order discounts are available. Contact us directly for more information. In addition, after ordering your book feel free to send us an email if you would like your copy autographed or dedicated in some fashion. If a dedication is desired, share any particular wording that you would like included. And, if you liked our book, don’t forget to post a book review on our website – or on the site of your choice. Right Side Creations, LLC operates in the world of creativity. As our logo depicts, our products are the result of activities related to the right side of the brain. In addition to creativity, our right brain activities encompass characteristics such as imagination, observation and story development, consideration of various possibilities, intuitiveness and insightfulness. Results of our right brain activities include production of books and other materials that provide unique outcomes and life enhancements for purchasers of our products. We are confident that the benefits that result from purchasing our products will be clearly evident. However, we invite you to review our product offerings and decide for yourself whether our merchandise will be of value in your life. © 2015-2019 Right Side Creations, LLC. All rights reserved. No portion of this website may be reproduced in any form without the express written consent of Right Side Creations, LLC.